Peter Hartley’s 94th-minute goal denied Rangers a win at Motherwell, but Steven Gerrard’s side still stretched their unbeaten record to 11 matches. Hartley, who apologised on Friday after saying it was “fun to watch” ex-Rangers defender Fabio Cardoso “weeping” after breaking his nose against Motherwell last term, tapped in a stoppage-time corner in a frantic conclusion to a gripping contest. Gerrard’s men had trailed twice, for the first time in his tenure, to goals by Danny Johnson and Carl McHugh. But a double from Kyle Lafferty – a volley and a header – brought the visitors level, before Ovie Ejaria had put them 3-2 ahead at the end of a stunning opening half. The two dropped points left Rangers four points behind early Scottish Premiership frontrunners Hearts as they enter another taxing week. Gerrard’s side take a 1-0 lead to Russia for Thursday’s second leg of their Europa League play-off tie against FC Ufa, before the first Old Firm game of the season next Sunday at Celtic Park. Motherwell’s first league point of the season moved them off the bottom of the table. Rangers’ rearguard have earned deserved praise for their resolve so far this season, with only four goals conceded in their first 10 competitive games under Gerrard. But they looked anything but solid in the opening stages, breached twice inside 18 minutes as Motherwell set about reversing a run of 40 matches since their last league win over Rangers on Boxing Day 2002. Richard Tait’s long ball should have been dealt with comfortably, but Connor Goldson slipped horribly to allow Johnson in to lift the ball left-footed over the advancing Allan McGregor. Chris Cadden’s dangerous ball across the face of the Rangers box might also have found a recipient as the hosts rediscovered some of last season’s vigour. If Goldson’s error was unfortunate, the marking for Motherwell’s second was non-existent. Gael Bigirimana swung in an enticing free-kick, but McHugh was given the freedom of Fir Park as he steered a precise header into the far corner. 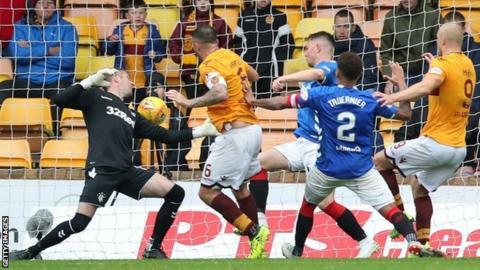 After a fitful second half punctuated by stoppages, Motherwell laid siege to the Rangers goal in the final 15 minutes, with Hartley heading over and Curtis Main nodding a good chance wide. Their onslaught paid off in the fourth minute of injury time as the visitors failed to deal with another set-piece. Bigirimana’s corner from the left eluded everyone and the unmarked Hartley could hardly miss from three yards out. 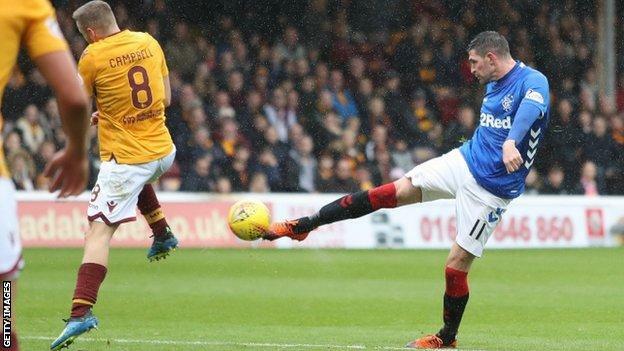 Lafferty, given a second full debut for Rangers 10 years after his first, was clearly eager to make an early impression, and his partnership with Alfredo Morelos offered plenty of promise as Motherwell’s back three struggled to cope. An early header forced Trevor Carson into a save, but the Northern Ireland striker did not have long to wait for the first goal of his second Ibrox spell. When Hartley’s headed clearance fell to him on the edge of the area in the 15th minute, Lafferty showed superb technique to volley it right-footed into the net with the help of a deflection off Tait. Lafferty’s second arrived seven minutes before the interval to restore parity for a second time. This time his movement to the front post eluded Tom Aldred and he buried James Tavernier’s superb in-swinging cross with a downward header. Incredibly, Rangers were in front by half-time. Borna Barisic, who provided a regular supply of ammunition from the left flank, found Ejaria on the edge of the Motherwell penalty area. The 20-year-old midfielder, on loan from Liverpool, controlled the ball with his first touch before turning and curling an effort towards the right corner. Carson got a hand to it, but the Motherwell keeper could not prevent it bouncing over his line. What a game. What stunning entertainment in the pouring Lanarkshire rain. From the start it was obvious this was never going to be ordinary. The Goldson slip and the early goal set the scene and what follows left everyone inside Fir Park breathless. We got slips-ups, square-ups and goals to remember; debut strikes and a last-minute leveller to make amends for unwise words. This one had just about everything. Both managers feel they should probably have taken more, but any neutral watching will tell you a point each was fair. When the dust settles, both bosses will look at the positives. Rangers showed good mentality to fight back from a goal down, and then looked like the side who might run away with it. And Motherwell showed again what made them feared by many last season – a group of players up for the physical fight but also more than capable of playing football. A cracking advert for the Scottish game. More of the same please. Match ends, Motherwell 3, Rangers 3. Second Half ends, Motherwell 3, Rangers 3. Goal! Motherwell 3, Rangers 3. Peter Hartley (Motherwell) left footed shot from the centre of the box to the centre of the goal. Assisted by Gael Bigirimana following a corner. Substitution, Rangers. Lee Wallace replaces Ovie Ejaria. Corner, Motherwell. Conceded by Nikola Katic. Foul by Peter Hartley (Motherwell). Kyle Lafferty (Rangers) wins a free kick on the right wing. Corner, Motherwell. Conceded by Ryan Jack. Corner, Motherwell. Conceded by James Tavernier. Attempt blocked. Conor Sammon (Motherwell) right footed shot from the left side of the six yard box is blocked. Attempt missed. Conor Sammon (Motherwell) header from the left side of the six yard box misses to the right. Attempt missed. Curtis Main (Motherwell) header from the right side of the six yard box is close, but misses to the left. Substitution, Motherwell. Ryan Bowman replaces Andy Rose. Attempt missed. Peter Hartley (Motherwell) right footed shot from very close range is just a bit too high. Elliott Frear (Motherwell) wins a free kick on the left wing. Substitution, Rangers. Glenn Middleton replaces Borna Barisic. Attempt blocked. Chris Cadden (Motherwell) right footed shot from outside the box is blocked. Substitution, Motherwell. Conor Sammon replaces Danny Johnson. Attempt missed. Kyle Lafferty (Rangers) right footed shot from the centre of the box misses to the left. Foul by Gael Bigirimana (Motherwell). Corner, Motherwell. Conceded by Connor Goldson. Nikola Katic (Rangers) wins a free kick in the attacking half. Attempt blocked. Richard Tait (Motherwell) right footed shot from the left side of the box is blocked. Substitution, Rangers. Scott Arfield replaces Andy Halliday. Andy Halliday (Rangers) is shown the yellow card. Danny Johnson (Motherwell) wins a free kick in the defensive half. Foul by Jon Flanagan (Rangers).